SXSW Day 03: Is That Recoupin’ Or Is That Recoupin’? I checked out the Sacred Animals at the Aussie BBQ to begin the day. I remember them being electro-rock like and enjoying it very much. There’s a theme of rock bands with laptops for me this year. To switch things up I went upstairs and was lucky enough to catch The Seedy Seeds (after some black metal band I will just not mention). This power trio switched instruments alot and seems to be the only band that has a banjo with techno music beat backing. Very upbeat and tasty indeed. Every year I pop down to the D’Addario party to get a hamburger and a fresh set of acoustic guitar strings. Welp I got my medium weight strings and checked out the very rocking Novocaines. I talked about these guys before but I can’t put in words the energy they have on stage. This is what rock and roll needs to be. Round and round we go to the next party and it was the Berklee Music joint. I wasn’t too excited about Emily Albert and the backing band there. Last year I napped here and this year I kinda wished I did. That said, they seem to jam off each other pretty well. Seriously Latitude 30 and the British Embassy has got to be my favorite day party of SXSW. I always seem to end up there. For Day 3 I double backed and spotted some ambient musings by Dam Mantle. The build up was great for his style of music and is something I’ll be popping on the headphones at work. Next up was another set of Unicorn Kid. Redemption was the song as I watched this real kid bounce on his gear pumping out video game techno. I felt like I nabbed a 1UP while noshing on this second helping of The Kid. It was party tent time next and I checked out a one Laura Jansen. She reminded me of a Dutch (out of LA) version of Joni Mitchell. She kept the beat up well enough to get me from sitting position to standing. 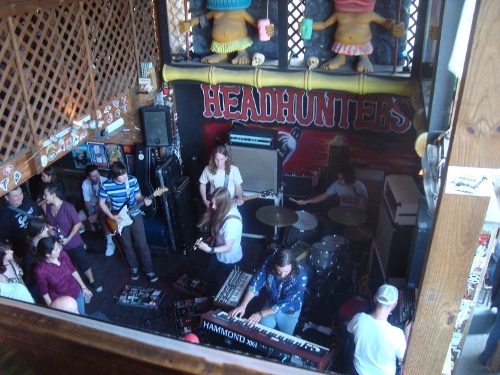 After a brief break, Headhunters was the place to be to start out the evening. Headhunters gets the award for worst bathroom break of the year while Mondo Drag gets my psychedelic band of the year. These Iowa boys kept on driving and driving on their vintage gear in such a cramped place. I’m going to tune out with these guys real soon again. Empress Hotel offered a nice break in the action with their poppy New Orleans sounds. Again, electric dance layered every other instrument for this band. The only difference is that Empress Hotel seemed just a little more heartfelt. My lady liked Empress Hotel mucho mucho mucho. The hit of the night for me was a blast from the past, and the first one at that. Jonathan Edwards, the guy who brought us the 60s hit ‘Sunshine,’ is actually putting out an album after about 20 years. To celebrate, he had his trusted bass man Stewart Shullman, a poached mandolin player by the name of Taylor Armandame, and a great banjo player named Charlie Rose. This was a pickers paradise as folk and bluegrass collided in a great palette cleanser for me. You can tell the difference between a new musician and an old one when the new one uses a pedal to tune and an old one uses his ear. The whole conference this year was electric and Jonathan Edwards brought a musicianship I missed until then. Fantastic. Speaking of electric, The Chain Gang of 1974 was up next and karma was at play. The lead singer was way too into himself and I believe they took things just a little to seriously. That and they just were never happy with the sound. They kept wanting to up the vocals and guitars on the board, even through a few songs. Of course, some breakers flipped and the power went out. Apparently the studio sound is a sight to hear but live wise they sucked. I was doing my best to avoid hip hop this year but I just couldn’t I got in early to see the next guy and because of that I had a mini treat called Araab Muzik. This pint sized dude sat in front of some sort of grid pad drum machine and banged away at like a zombie. Entranced in his beat mashing, Araab Muzik conjured up some weird sounding shapes. I finally got into it by the end and actually missed him when they cut his set short. A-Trak was part of the Invisible Scratch Pickles collective and I was lucky enough to see a good 15 minutes of his set last night. He is a pro and it was about time I saw some professional turntablism. I very much prefer the needle pricking as opposed to the hip hop type songs he put out. Lastly, a giant of the 80s woke up and finished out the night. In a mix between Kraftwerk and Devo, Men Without Hats forged a quirky, weird revolt in the 80s. After listening to more than just the ‘Safety Dance,’ I can say the I feel like I missed something with these guys and I need to regroup. Much like they did for SXSW. More regrouping after the recouping for me. The last day finished out perfectly and even after fighting off some symptoms, I managed to wrap up the whole conference strong. Stay tuned for my last day review.